For years, the Hiddur Mitzvah Project has been a favorite community activity for groups of all types across the country. Now bring the experience of creating custom Gary Rosenthal Judaica into your home with these individual candlestick kits. 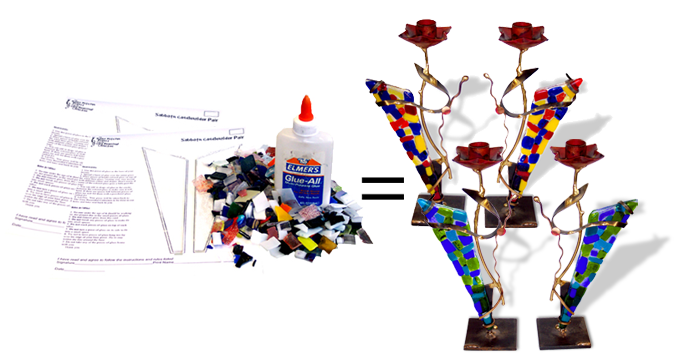 Each kit contains two glass templates for either the SC3 candlesticks (pictured above) or a pair of SC7 (below), a selection of glass mosaic tiles, and instructions. You need only provide craft glue and imagination! A one time $20 shipping charge covers three way shipping - the materials sent to you, the kits and unused material returned to us, and the finished candlesticks shipped back to you in the end.